Hugh Ross trained at the Royal Academy of Dramatic Art, and has worked extensively in theatre, film and television. Theatre credits include The Woman in Black at the Fortune Theatre, A Prayer for Owen Meany at the Royal National Theatre, and Bent at Trafalgar Studios. 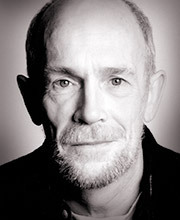 He has acted in Charlotte Grey and Trainspotting, among other films. His television work includes Sea of Souls, Lovejoy and Absolutely Fabulous for the BBC. Hugh is also active as a director, with credits including After Liverpool with The Royal Shakespeare Company. He has also read Aristotle: An Introduction for Naxos AudioBooks.